I thought I might share a pic of this guy. In the end, he's not much more than a regular Genestealer, but I added an extra step when it came to painting him since he's so big and GW made an effort to show his muscles. When I painted the regular Genestealers, I based them dark blue, added the highlight and then washed them to tie it all together, blend the highlight and tone it down a bit. 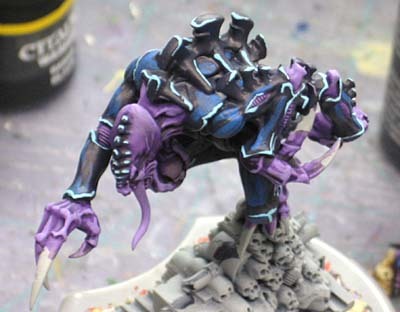 With the Broodlord, I based him dark blue, added the highlight as normal and then went in with a medium blue and highlighted his muscles along the top of his body where any overhead light my bring them into sight. Then I washed the model as normal. 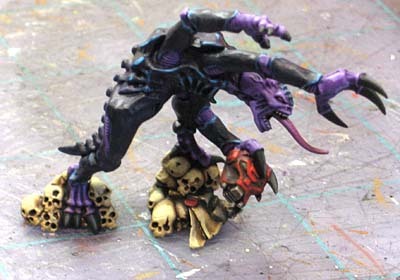 By doing this, the wash blended in the muscle "highlights" and made it fairly subtle in the end. 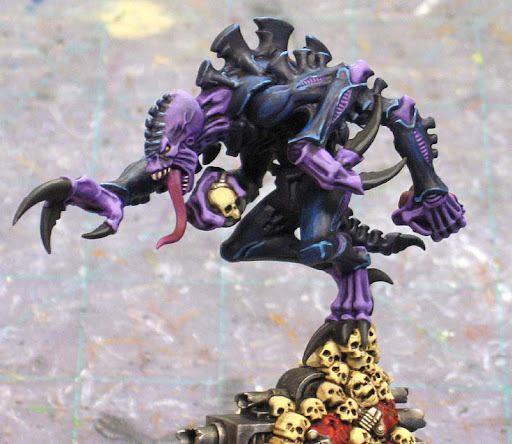 It's a nice touch to the model and makes him look a little more imposing than the regular Genestealers. And that finishes up my second Space Hulk commission. These are lots of work, but I can't imagine playing the game with unpainted pieces. Looks great Ron. Still working on my Calistarius for now but thinking I'll do the Brood Lord next and then simplify how I paint him for the rest of his brood. Were all these minis as much fun to paint the second time around? Very very nice...I like the layering work on the skin...very crisp sir. 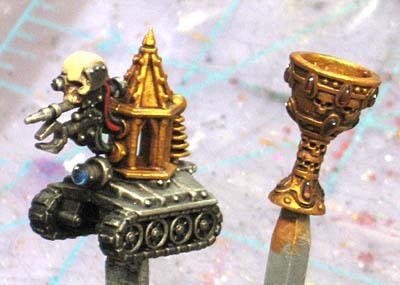 What colors did you use for the skulls? Elazar: The were much easier the second time since I already knew the formulas... which meant that I could trade the time I made up for better painting. CanolliCrusader: It's a light tan color (Desert Sand by Americana) that is washed with Devlan Mud and then rehighlighted with the original color for contrast. Excellent work again Ron! I like the gemstones on the playing pieces - they're been highlighted really well.